I came across another really neat subscription service that's geared specifically toward kids. It's all about space. It's called Space Scouts. What kid doesn't like learning about space? Each monthly packet will include a Space Scouts exploration plan describing the place to be scouted, a Space Scouts magnet to add to the Space Scouts lunchbox, a Space Scouts sticker to add to the Space Scouts solar system poster, a Space Scouts activity sheet loaded with puzzles, games, and activities, a Space Scouts sticker scramble (unscramble the numbered stickers to reveal a surprise! 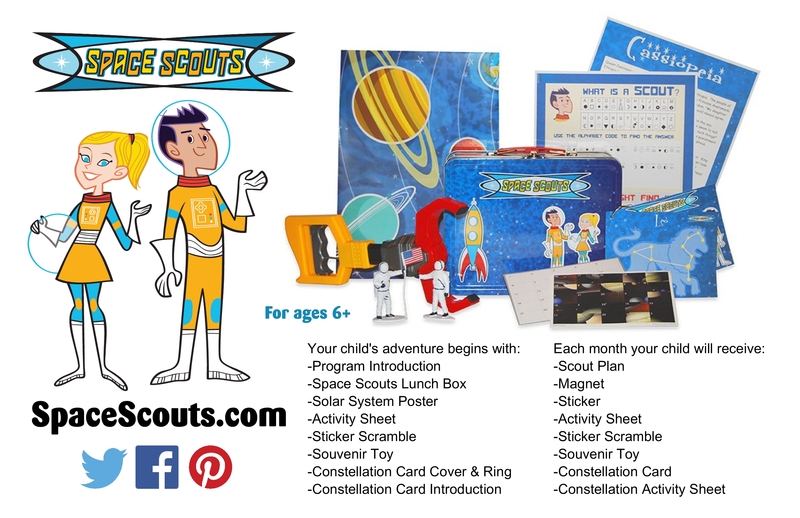 ), a Space Scouts souvenir toy to use in learning activities, a Space Scouts constellation card, and a Space Scouts constellation activity sheet that includes the mythological stories and other learning activities to help your child identify the constellation in the night sky. My son LOVES this lunch box. While he was enrolled in this summer program, he would take his lunch inside of this box everyday. Now he carries a bunch of his little toys in it whenever we go places. It's a pretty nice lunch box. The lunch box was filled to the brim with some really fun and also educational activities. He didn't know where to start and kept moving from one thing to the next. One of his favorite things inside of the box was the pack of Wikki Stix. Every played with those? They're these sticky wax-like sticks that can be shaped into different things. There is a poster (the picture of the rocket) that he has on his wall. There is a cool little puzzle with the planets, a constellation card collection activity and a sheet with even more fun games on it. It sure kept him busy for quite a while, which I'm not complaining about. Gave me a little bit of free time. The other pack was also packed full of fun stuff for him. This one had stickers, little astronaut figurines, a plastic claw, some magnets and activity sheets. Again, everything inside was both fun and he learned new things. I do think that this is a nice subscription service for kids, especially elementary aged children. They can pretend they're little astronauts going on a mission. My son had just gotten out of bed, so excuse the bedhead...but he was so happy when this exciting little mystery box arrived on our doorstep that morning. They have different package deals available. You can pay monthly, every 3 months, every 6 months, or a yearly price.